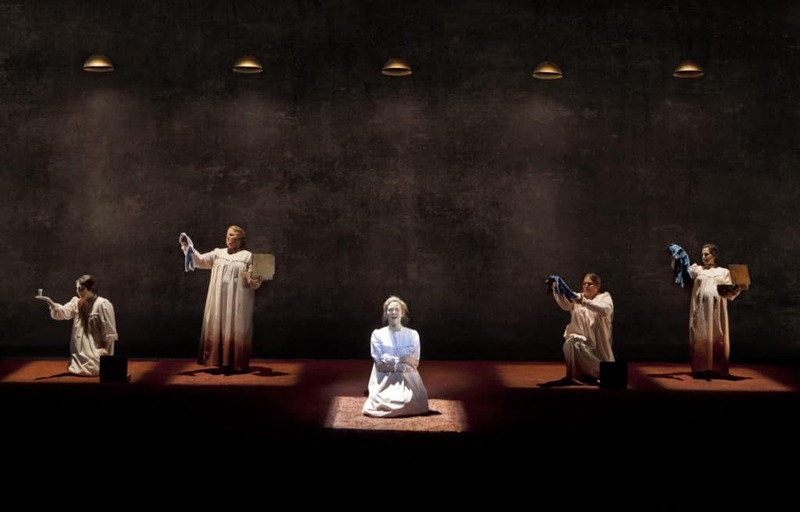 Dark Sisters, an opera with music by Nico Muhly and a libretto by Stephen Karam, was co-commissioned by Gotham Chamber Opera, Music-Theatre Group and Opera Company of Philadelphia for a 2011 World Premiere. 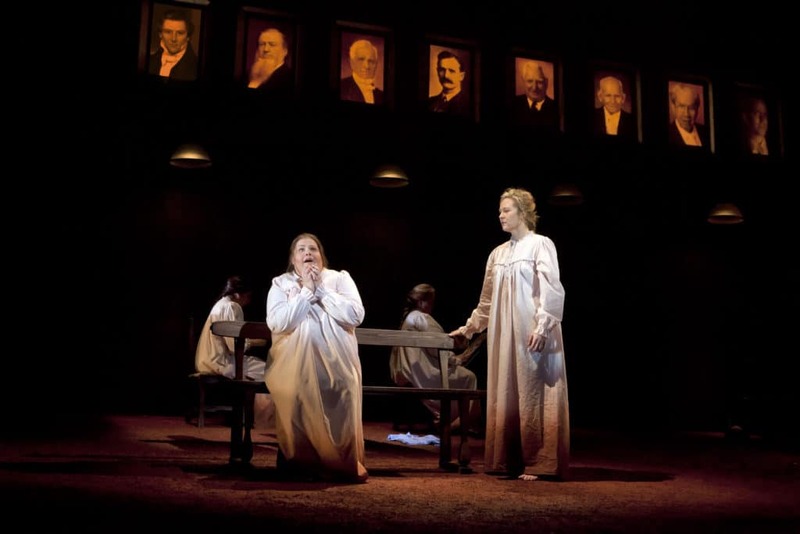 Both set and projection were designed by Leo Warner and Mark Grimmer of 59 Productions. 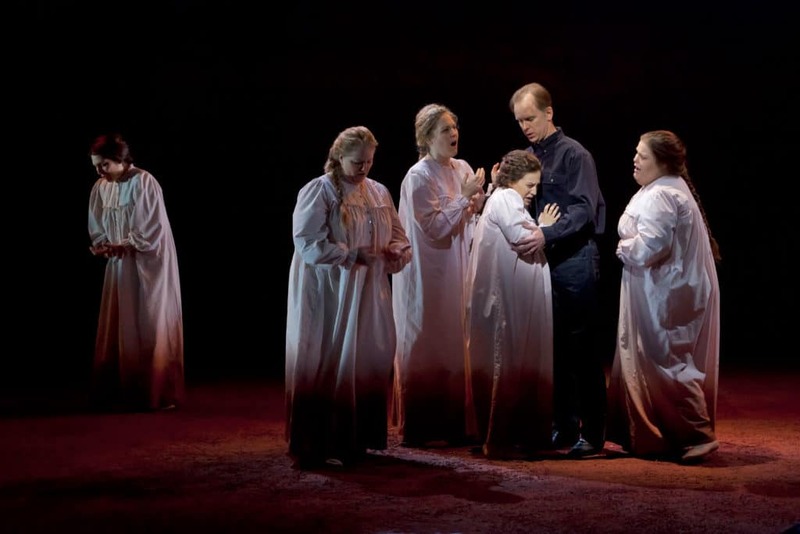 The opera follows one woman’s dangerous attempt to escape her life as a member of the FLDS Church (Fundamentalist Latter Day Saints), a sect that split from mainstream Mormonism in the early 20th Century largely because of the LDS Church’s renunciation of polygamy. 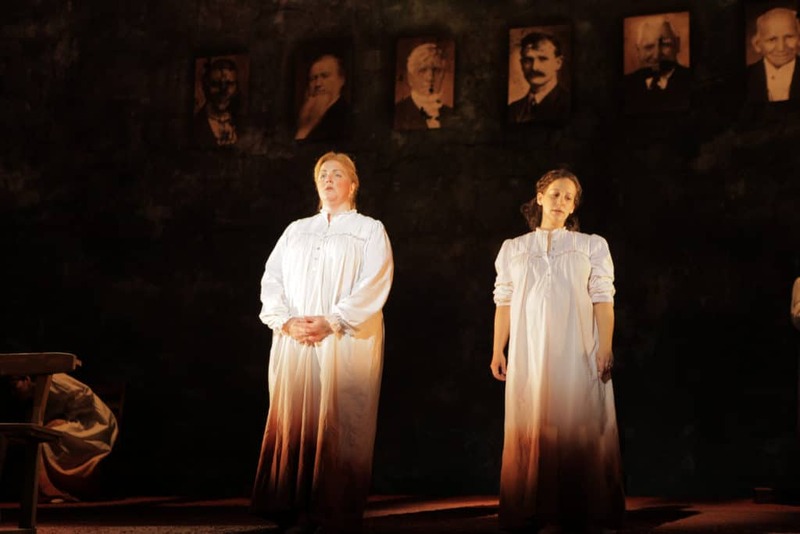 The male founders of the Mormon faith (Joseph Smith and Brigham Young, chief among them) have traditionally loomed large in American history; Dark Sisters puts the women of the FLDS sect front and center. The narrative draws inspiration from the flurry of media attention surrounding the two most infamous raids on FLDS compounds (the 1953 raid at Short Creek, AZ and the 2008 raid at the Yearning For Zion Ranch in Eldorado, TX) as well as the stories of the over 80 wives of Joseph Smith and Brigham Young. Set against a red-earthed landscape filled with revelations, dark prophets and white temples stretching towards heaven, Dark Sisters charts one woman’s quest for self-discovery in a world where personal identity is forbidden. Dark Sisters has a Leo Warner, 59 Productions set and video design stark in a red-earth manner and on which projected clouds shift ominously. With every artistic touch, every special effect, the chamber opera seared itself into the audience’s soul: from the captivating projection of a Southwestern sky crowded with stars to each floor-length dress hem as muddy as the clay that the Dark Sisters have been ground into by a backwards religious cult that subjugates women. 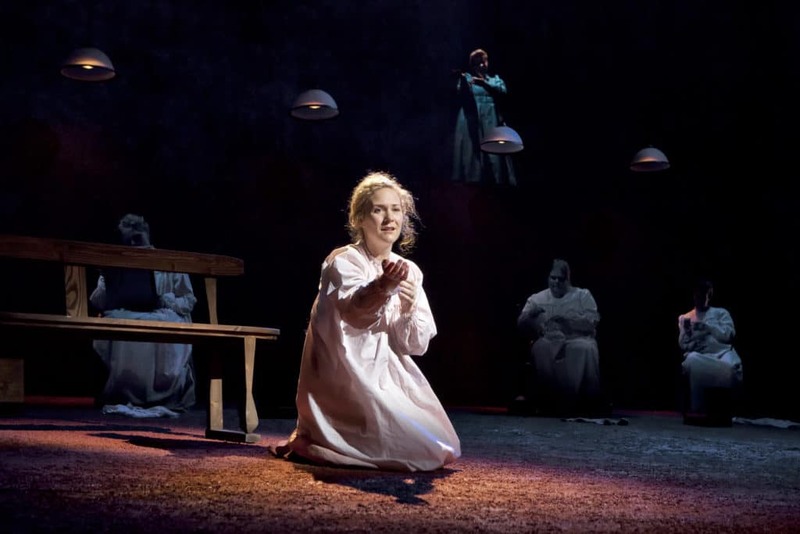 The wondrously simple production by Gotham Chamber Opera, the Music-Theater Group and the Opera Company of Philadelphia, directed by Rebecca Taichman, powerfully sets the scene. 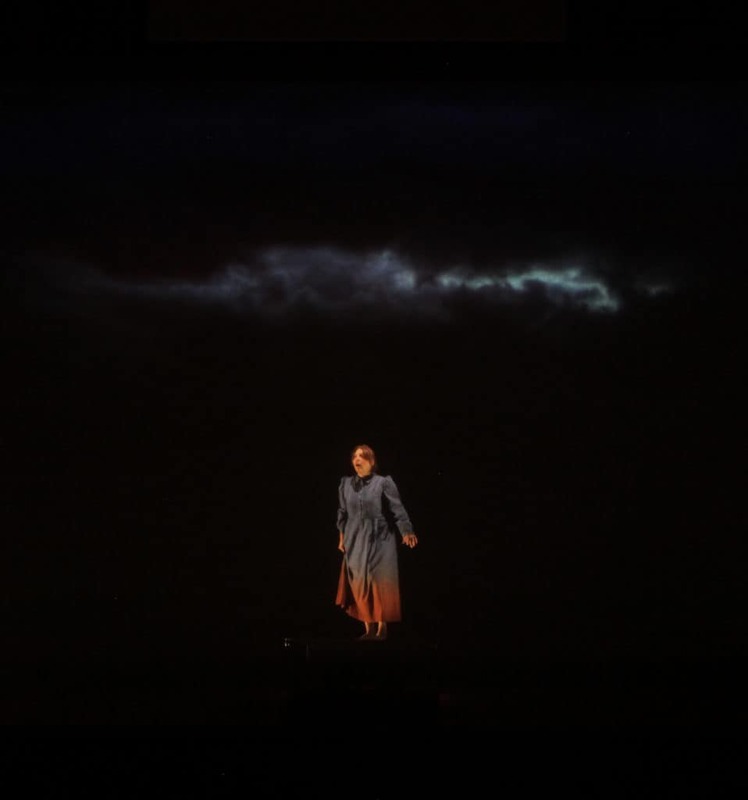 Video images on a back screen depict a dark, cloudy, expansive sky; rugged carpeting lighted in hues suggests the red earth. The women first appear in matching cream white nightgowns.